Have you ever been so cold that your body refuses to work? Your fingers and toes don’t want to uncurl, your arms and legs refuse to move you from your warm spot in the bed, your brain refuses to take your side in the argument against your body on the fact that you must go to work today. Ultimately, for most of us, we make it out of bed and get to work as close to ‘on time’ as possible and we aren’t that much worse for wear, but we don’t do it without help. Layers of clothing, scalding hot coffee, and a remote starter on your vehicle are just a few of the things that could have braced you for your day. What braces your devices for their day? Reader-Inside-My-Head…you are on fire with the questions this week! Did you know that you can get a pair of gloves that will let you work your iPhone or Android device while wearing them? Touchscreens use something called Capacitive Touch, basically they use your finger as a conductor to determine where on the screen you are touching. When you’re wearing normal gloves, your finger isn’t able to conduct the current and nothing happens. These gloves have a conductive thread woven through them that allows them to become the conductor when touching the screen. You can even buy the thread yourself and sew it into your own favorite pair of gloves. I wouldn’t…but you definitely could. 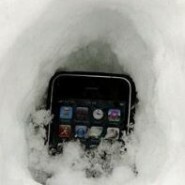 But you said that using the iPhone in the cold was a bad idea, I read your article yesterday! Indeed I did, Reader-Inside-My-Head, but there are things you can do to keep your device warm while working in the freeze. There is a Kickstarter project that is looking to produce self heating cases for your devices. It keeps the heat out on a hot day and redirects your device’s own heat back in on a cold day. Until you can get one of these though, the best thing to do is keep your device on you, in a pocket, close to your body where it can share your heat to keep it happy. Don’t leave them laying in a parked car or in a toolbox on the job site. You also might be able to use a portable battery charger if you get stuck out in the cold without a power source to keep your game of Candy Crush going. Or a nice stylus if you feel you’re too manly for the gloves mentioned above. Technically, your nose could also work on your touch screen…but if you try that out then keep your phone to yourself, please. Tech in the Deep Freeze, Pt 1.